I hope everyone is having a great year and is well on their way to meet most of their goals. Speculative account (this is My Robinhood account I opened and wrote a review of here) – So far I’ve added shares in TCEHY, BABA, MTCH, EBAY, UA and APPL. My Robinhood account is up to around a $4k value since I opened it. I’m currently transferring about $125/week in there. BBVA – Added another 250 shares on weakness spending $1518 and reducing my cost basis. DIS – added 55 shares for $6163. DEO – added 35 shares in 3 different purchases for a total of $5,052. MDT – added 24 shares for $2305. RDS.B – added 30 shares for $1980. I earned $3911 in dividends for the quarter up from $3,097 the last quarter. This is a 26.3% increase from the previous quarter! This is just my second time to surpass $3k/quarter. I’m planning to break $4k/quarter the last quarter of this year and hit $5k quarter sometime next year. My expected forward 12-month dividends as of 09/28/18 was $18,039. This is up from $16,061 a quarter ago. 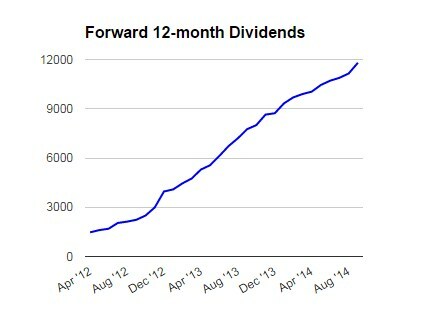 My forward income has risen quickly since last year. I broke the $12,000 level ($1,000/month) not long ago and wrote about that in March. My new goal of $18,000 of forward dividend income by the end of the year has already been reached. I’ve had 25 companies raise their dividends since the beginning of the year. The only expected dividend increase that didn’t occur was from GIS, they kept their dividend the same. 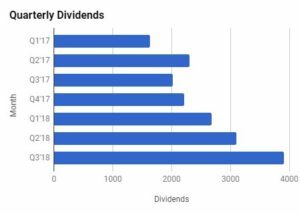 Earn $11,320 in dividend income , 40% increase from 2017. I currently own 3 4 rental properties and 3 are leased. My goal is still to buy one more this year, I need to hurry! Rates have been rising like crazy. I had tenants move out of the property i mentioned in the last quarterly update. Their lease ended in September and I am looking for new tenants. The prior rent was paid for by an insurance company because the tenants house had burned down. Well, their house was finished and they have moved out now. I don’t expect to get as high of rent as the insurance offered but that was a nice buffer for this month which seems to be a wash. I’m doing some minor repairs and replacing the only carpet in the house with vinyl flooring to match the rest of the house. It’s much more durable and will last a lot longer. I have some showings lined up later in the week. My goal is to have it rented and new tenants move in by the first of November. I’ve had a lot of options activity. 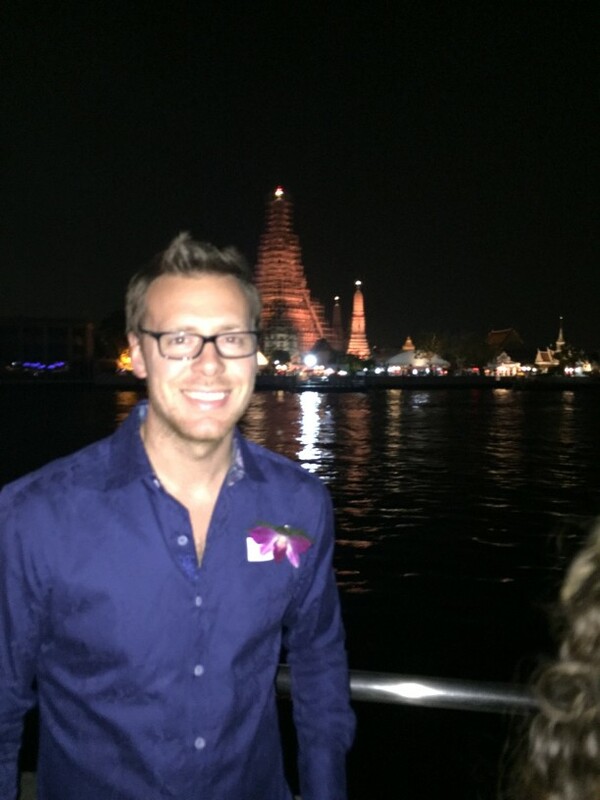 You can follow all my updates from my Options label. I’m due for another update, look for that soon. I’ve started to update my net worth again. Currently at $933k, up from$880k at my last quarterly update. I should hit the $1 million mark next year. I’ve already reach my goal of a $500,000 portfolio by the end of the year. I’m going to significantly slow down purchases through the remainder of the year as I build up some cash for another rental property purchase. On the real estate front, I am concentrating on leasing one vacancy I have. Once that’s complete I’ll focus my energy on looking for another property to purchase. I’m not in a big hurry so I’ll bide my time and wait for a good deal. My Net Worth has a small chance to break the $1 million mark this year. I’ll need a little help form the markets to make that happen. You can bet I’ll be posting that milestone for sure once I hit it. 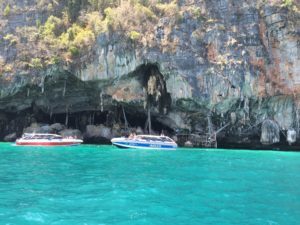 *Picture is from Phi Phi Islands in Thailand I took a couple years ago. WOW!!! this post has left me both breathless and motivated! Looking through your posts and watching the power of compounding has only sparked my ambitions and motivation. Thank you for sharing your incredible dividend income. I look forward to watching you surpass that 5k mark in the coming year. Catch your breath , haha. Don’t worry, if you keep up the consistency on your end then you’ll be at this level in no time. The key is to start early and be consistent. I’m happy to motivate anyone with what I’m doing over here. I feel like I got off track a little for a couple years but I’m bouncing back now. The 5k quarterly mark will be a big milestone and hopefully I’ll hit that by the 2nd quarter of next year. You’re moving right on up. Like me you must be able to start sniffing the finish line. Great job! Not sure if you put your primary residence into net worth. I’ve deliberately not done that since it cannot generate income, though by being paid off it saves on future income needed for housing. I share some of your watchlist stocks. Throw in TXN, which I recently initiated a position at $99.50, and AAPL, which is still in dividend infancy. I’m sniffing it but it’s still a little ways away lol. I do have my primary residence in net worth. It’s only adding about 50k to mine since it was a purchase made about a year ago. It’s not liquid capital, but I think it should still be included just like a vehicle in your net worth to give yourself an overall picture. Yes, I’ve missed out on TXN but it still looks like a solid company to invest in. I’ll have to dig in a little deeper. I invested in Intel years ago and it was stagnant for about 5 years, I sold it and haven’t really gotten back into tech stocks until I bought a few shares of Apple. They have been typically cyclical but now things may be changing a bit. Looks like you had an awesome quarter, especially with a 26% increase over the last quarter, and it looks like you almost doubled your dividend income from the previous Q3. Hoping that you’ll be able to hit your 1M goal, but the market hasn’t been so cooperative these past two months. You’re moving appropriate on up. Like me you should probably begin sniffing the end goal. Extraordinary employment! Not certain on the off chance that you put your main living place into total assets. I’ve purposely not done that since it can’t create pay, however by being satisfied it saves money on future salary required for lodging. I share a portion of your watchlist stocks. Toss in TXN, which I as of late started a situation at $99.50, and AAPL, which is still in profit outset. Thanks for stopping by to comment. The end goal for me is financial independence where I can do what I want to, when I want to. That could and likely will include working, as long as I enjoy it. I do keep my primary residence in assets and part of overall net worth because it’s still an asset. It helps present a better overall picture. I also like AAPL and have been adding to it in my RobinHood account. I need to look at TXN, it seems to be a popular dividend payer, I just don’t want too much tech. Since V is considered tech, between that and AAPL I’ll probably have the weighting I want so not sure if I have room for another.